Lex Luthor tells Mercy that when he asked Brainiac to stop messing with Superman's powers, that all Brainiac did was kick the plan into overdrive and Lex knows that the person most likely to get hurt will be Lois, whom he claims to love. But even now he thinks he's keeping his conversations secret, but Brainiac watches from his ship in space. Mercy suggests that Lex's love for Lois is clouding his judgment and that perhaps it would be best if she was sacrificed, but the thought angers Lex. And now that he knows Superman's secret identity, he decides it's time to take a closer look at Clark Kent's file in order to reevaluate all the details he must have missed or ignored before. Meanwhile Brainiac goes over his plan and how it has unfolded so far, Thanks to the help Lex Luthor provided, he has an army or robots and has digitally downloaded information about the human species from his captives when the Daily Planet building was his to control. Once everything is completed and he has all the remaining information about Earth's metahuman population, the entire planet and everything on it will be deleted. Back to last issue's cliffhanger, Superman continues to fight off members of the Justice League whom he still sees as Brainiac's robots and attacks with deadly force. In the middle of it all, Batman asks Flash if he has the Kryptonite ready. But before even the fastest man alive can act, Superman grabs Wonder Woman and flies up in the air until his powers fluctuate again and he begins to fall out of the sky. Captain Marvel tries to catch him in the air, but Lex Luthor appears out of nowhere, grabs hold of Superman and teleports away from the battle to a secret location, but Batman thinks he can find out where it is. 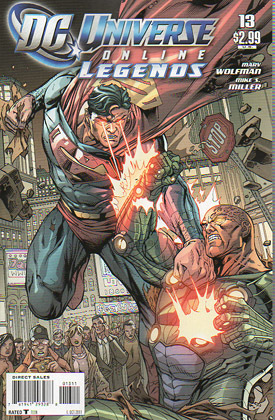 Once Luthor and Superman arrive, Superman snaps out of his delusions and immediately attacks Lex, but Lex shows that he has newfound power and stuns Superman with an energy blast from his exoskeleton. Once in his place, Luthor explains that his powers are out of control because Brainiac is testing him to find a way to steal his abilities as he has with some of the other Justice League members. He also reveals that he knows about Superman's dual identity and wants to help him in order to protect Lois. And worst of all, Luthor knows Brainiac's ultimate plan to wipe out all life on Earth as soon as he's completed his objective. And Lex doesn't intend to allow any of it to come to completion on his watch. Batman brings the Justice League members to his Batcave and against their protests, he activates some remaining Brother Eye technology (from back in the Omac Project and Infinite Crisis) and is able to zero in on Superman's DNA which leads to a repeat of Batman's arguments about why it's ok that he has all of the League's DNA on file. Batman grandstands by saying he'll do whatever it takes to save the planet, including lying to his colleagues, and that Superman would do the same. At the Daily Planet building, Lois stands in front of the crowd of workers, many of whom have been infected with Brainiac's exobytes and are exhibiting powers that they can't control or understand. She suggests a support group to help each other through these difficulties. When a member of the crowd yells that he doesn't wish to be part of a super team, Lois explains that this is simply a way to help, not to get on camera and make names for themselves. But Superman arrives and sees the superpowered Daily Planet staff and Lex Luthor as Brainiac's robots again and attacks with full force. The League quickly responds, but are no match for Superman when he thinks he's fighting non-living enemies. Lois steps forward and tries to convince him she's real and that he needs to stop or someone will get hurt or killed and he won't want that on his conscience. Superman still believes it's a trick and prepares to kill her with a blast of heat vision, but Lex Luthor manages to push her out of the way just in time. But Superman redoubles his efforts and prepares to destroy them all. Story - 2: This issue accomplished nothing new that was in any way valuable. Instead it retreaded on everything the last few issues already dealt with. Even the cliffhanger was the same as it was last time. Superman's powers are still wonky and he's seeing good guys as bad guys and he's about to kill someone. But even that isn't my biggest problem with this issue. Once again, we revisit this concept that BatGod has all the answers and does everything that needs to be done even though the League has asked him not to. After a Justice League story in the early 2000's, Batman promised not to keep secret files on everyone, but a few years later, it turned out he was lying and still gathering private info which backfired and got people killed. After he was caught again, he apologized and promised never to do it a third time. So here he is doing it again and this has become an annoying cycle. It's like a drug addict promising not to do drugs, but getting caught once a month, promising to stop for real and NEVER doing it. Batman is officially a liar, a cheat and a fraud at this point. Sure his lies allowed the League to find Superman, but this has become a compulsion for Batman. Sadly, it comes down to lazy writing and I hate to say that because I'm a HUGE fan of Marv Wolfman. I'll play backseat writer for a moment and say that instead of having Batman be a total jerkwad liar in the same exact way he already has been twice in a decade and always promised NOT to be, just have him say, "Superman knows he's lost control before and could be a danger again some day, so he voluntarily gave me his DNA in case a situation like this ever came up again." And just to get nitpicky for a second, there was a big deal made a few issues ago about Martian Manhunter losing ALL of his powers thanks to Superman's negligence and yet he flies into the battle at the end of this issue carrying Black Canary. Did someone miss a memo? Regardless, Batman was wrong again and needs to get off his high horse. If Batman has all the League's DNA on file and can do this, why not use it every time someone goes missing? Better yet, the next time the Joker is in Arkham, get some of his DNA so that when he escapes, Batman can catch him again is about 5 minutes. The only reason I can see resurrecting the Brother Eye concept is because something more will be done with it in later stories. It was used poorly here, so the payoff better be worth it. Anyway, this series has been largely predictable so far so here's my prediction for next week: Superman knows exactly what he's doing and he and Lex are just trying to trick Brainiac. Lois and Lex will both be fine. Ok, let's see how we do. Art - 3: As much as I've liked Mike S. Miller's art from previous issues, it took a dip here. It was fine at first, but the quality went down half way through. The scenes in the Batcave just look off by comparison, but there's a chance the coloring and shading are simply throwing me for a loop. The battle scenes didn't hold up to previous efforts either and angry/crazy Superman looks overblown, even though that's probably the point. The throbbing veins under the costume are clearly intended to be a visual effect, but it looks ridiculous and off putting. But in spite of that, the two page sequential splash image near the end looks pretty dynamic. Cover Art - 2: This cover does nothing for me. Nothing. It doesn't make me want to pick up the book and as action images go, it's a low point. Both Superman and Lex look like they're specifically posing instead of in the middle of a fight. The proportions are off, so Superman's head looks tiny against his body and I have no idea why the cape symbol looks the way it does. To quote the street sign in the mid ground of this cover image, "stop."